Submitted photo Pastor Rev. Dr. Gloria Dillon with her family husband Vermon and son Micah. XENIA — The Glory Ministries Church Associate Ministers officers and members invite the community to the combine celebration of the Tenth Pastoral and Church Anniversary. Founder and Pastor Rev. Dr. Gloria Dillon will be honored along with the and 10-year old congregation. The anniversary theme is “Keeping It Moving” — Philippians 3:14. The celebration will host two worship services Sunday, Sept 16 at the church, 880 Hoop Road. The 10 a.m. service will include guest speaker Sister Kitra Martin-Davis of Virginia. Vessels of Honor will provide Praise Dancing & The Voices of Glory will render the music. At the 4 p.m. service Rev. Dr. Alphonse Allen, Pastor of Allen Temple AME of Cincinnati will be the preacher. Diamonds & Pearls will Provide Praise Dancing & Allen Temple AME Praise Team will render the music. “We are looking forward to the community joining us for this blessed occasion,” said Rev. Dr. Gloria Dillon in a press release. 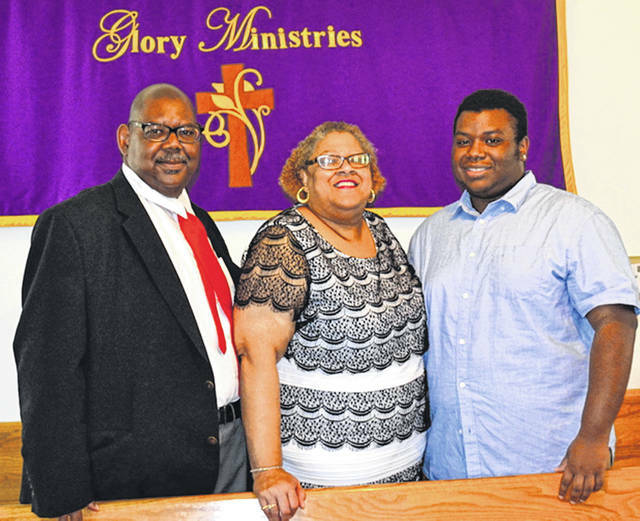 For additional information you may contact us at 937-372-3573.
https://www.fairborndailyherald.com/wp-content/uploads/sites/50/2018/09/web1_GloryMin.jpgSubmitted photo Pastor Rev. Dr. Gloria Dillon with her family husband Vermon and son Micah.